They’re watching you. They know if you’ve been bad or good. They know whether you really need that cashmere sweater at Macy’s. A new form of seeing eye mannequins may be coming to a storefront near you and you may never know they are there. 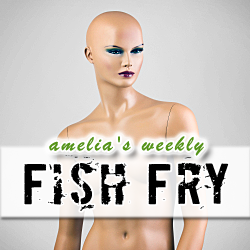 In this week’s Fish Fry, we check out some technologically enhanced mannequins from Italian company Almax, and try to decipher where exactly on the creep-o-meter this new product lies. Also this week, I interview ProPlus Design Systems executive Chairman Zhihong Lui about modeling tools, what their NanoYield solution is all about, and why his favorite tunes to play on the accordion are Russian. I have a brand new nerdy giveaway to throw your way this week, but you’ll have to listen to find out what it is and how to win.